Solgar Advanced Acidophilus Plus is a probiotic supplement formulated with the beneficial microorganisms Lactobacillus acidophilus and Bifidobacterium lactis. Taking probiotic supplements daily is a healthy choice, but not everyone needs a high-dose probiotic capsule or pill every day. Many people will experience positive results by taking low preventative doses which help to support proper immune and digestive function. These supplements work to restore the balance in the gut microflora by replenishing the GI tract with beneficial bacteria that out-compete pathogenic bacteria. Advanced Acidophilus Plus is a good choice for those wanting a low-dose daily probiotic supplement which has been consistently reported to be both effective and of high quality. It is also one of the few Lactobacillus Acidophilus supplements that is vegetarian and vegan friendly and does not contain any dairy products. Advanced Acidophilus Plus is a probiotic supplement manufactured by Solgar. This nutritional supplement manufacturer has been providing quality health supplements worldwide since 1947. The production process of Advanced Acidophilus Plus takes place with the use of a state-of-the-art reverse osmosis water purifications system. In addition, all air circulating through the Solgar facility is processed through a large bank of HEPA filters designed to remove 99.9% of airborne particulate matter. Besides taking these precautions for quality preservation of their supplements, Solgar also breaks down and cleans their machinery between product batches, as well as cleaning walls, floors and other surfaces before another formula is produced. For vegetarians, vegans and those with serious food allergies, this level of attention to cleanliness and sterility is important. The way in which probiotic supplements are manufactured may be even more important than with most other supplements; for this reason, Solgar introduced what they call their “Gold Standard” manufacturing process designed specifically to assure the quality of their product remains consistent and effective. This includes making sure it is properly handled along every step of the path which eventually leads to the consumer. Advanced Acidophilus Plus provides a standardized low-dose of acidophilus and B. lactis bacteria. This supplement is most effective as part of a daily health regimen for individuals seeking maintenance of a healthy GI tract, though some people with more serious disorders like IBS have reported some success when taking this product. Advanced Acidophilus Plus is manufactured from ingredients which are well-researched and suitable for vegetarians. The strains of L. acidophilus and B. Lactis used in Advanced Acidophilus Plus are specially cultured and trademarked by Solgar. These microorganisms have been shown to survive the stomach acids in the early stages of digestion, thereby enabling them to reach the small intestine and colon where they can help to maintain healthy gut microflora. Lactobacillus acidophilus is most at home in the small intestine where it inhibits the growth of many pathogenic bacterial organisms. One method of inhibition is achieved simply by out-competing the harmful microbes in the colonization of the intestinal lumen, thereby limiting the growth and spread of unhealthy organisms. Another way L. acidophilus inhibits growth of unhealthy bacteria is through a fermentation process in which acidophilus breaks down and converts sugars into acids and other chemical byproducts necessary for a healthy GI tract. Acidophilus has a particular preference for breaking down lactose (which can cause gas and flatulence), after which it converts it into lactic acid. Many people with lactose intolerance find relief when they supplement regularly with a quality source of lactobacillus acidophilus. Advanced Acidophilus Plus also work in concert with other probiotic organisms to promote better immune function. With over 70% of the immune system residing primarily within the gastrointestinal tract, any imbalance in the gut flora can exert an influence on immune response throughout the body. Women prone to vaginal yeast infections often supplement regularly with lactobacillus acidophilus to inhibit overgrowth of Candida albicans. Candida is a yeast which proliferates when there is a shortage of beneficial bacteria in a woman’s system. This shortage can be caused by oral antibiotic use, spermicides and contraceptive creams. Bifidobacterium lactis is the second main ingredient in Solgar’s supplement. It is most useful as it passes through the colon. In a healthy person, B. lactis is already present in great numbers, breaking down body waste materials and helping with the absorption of vitamins and minerals. There is some evidence suggesting B. lactis may be helpful in fighting the growth of certain cancerous tumors, though more research is needed to understand how and why this happens. Clinical studies continue to show that B. lactis can also be helpful in lowering serum cholesterol levels. Again, more research is under way to discover the exact mechanism of action for this effect. In the meantime, dosing with the amount included in Advanced Acidophilus Plus is a safe way to potentially gain the benefits of this helpful microorganism. 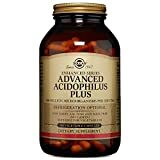 Advanced Acidophilus Plus is a low-dose probiotic supplement with two proven species of healthy bacteria which work together to enhance digestive function. It contains 250 million viable cells of both L. acidophilus and B. lactis, making it a gentle and safe nutritional product which may be taken by healthy individuals on a daily basis. Advanced Acidophilus Plus is manufactured with stringent levels of quality assurance to enable consumers a consistent experience with every batch.